‘kay she’s luminous, but what is her name?? Darn you, now I want one, too. I dunno why, but she just reminds me of Italian horror, or classic Hammer flicks. Maybe she looks like someone I haven’t figured out yet? Oh, and I think I am changing my vote from Veruca to Violet – she’s got a classic look, but she’s got shades of malevolence (hence the giallo / Hammer Horror vibe). And you know how much I love Hammer Horror. I did consider Carmilla! I love the name Violet too. And Hermione. And, and…. argh! Oooh Carmilla, I think though, this one’s too dark for that name, as contradictory as that may seem. Babette just sprang to mind…or, in the name of Hammer, how about Ingrid [Pitt]? My friend just named her doll Ingrid. I like Violet, too. How about Undine, or Sadie? Unrelated, but recent: last night, I searched for “super dollfie shoes” via MS Explorer (yeah, I know, I’m the only person who doesn’t use Google), and the Demelza gallery and the Fifi gallery were fifth and seventh on the list of results. Whoohoo! 2. Mania ~ Roman Goddess of the Dead, matron of madness, bestower of divine frenzy. 5. Tamerlane ~ Edgar Allen Poe, of course. Arrgghh…name her quickly or I shall go insane!!! My vote goes towards Varuca. She has a very Veruca Salt prima-donna aura to her, as if she’s giving you the evil eye so she’ll have her way. 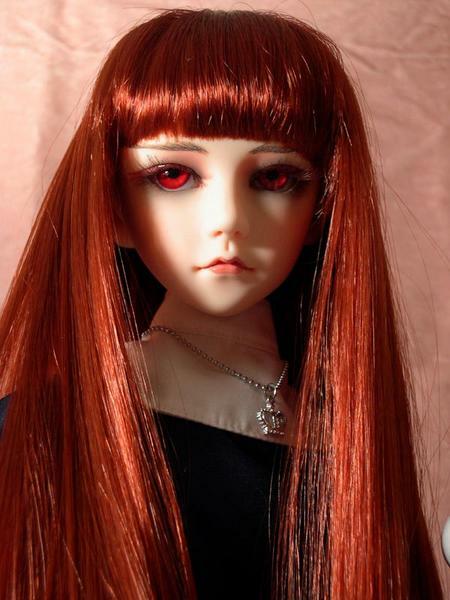 I love what you’ve done with her, she’s one of the most life-like bjd’s I’ve ever seen. Previous Previous post: Veruca? Violet? Verushka? Vesta? Vivia?